When you live in suburbia in close proximity to other people, it's important for good relations that you take steps to stop dog barking. A noisy dog can lead to ill will and even ill health amongst residents of your street or apartment block. Dogs that don't bark are much more welcome amongst your friends and neighbors. Dogs bark for many different reasons. Sometimes his barking is appreciated, for example if he is warning you of an intruder, but often he gets carried away and doesn't quieten down. To stop the noise, you will need to firstly find out the reason why he is barking, and then remedy the situation. Before we look at effective ways to stop dog barking, let's look at one approach that doesn't work. If you yell at your dog to “be quiet!”, or use even more colorful language, you will certainly startle him into silence. But, within minutes, he will have decided that you're joining in his noisy chorus, and it will encourage him to increase his effort. Resist the temptation to shout at a barking dog. It's never a long term solution. Some trainers feel that is a good idea to put barking on cue. That means that you train your dog to speak on command, and he then shouldn't bark unless he is asked to. It sounds good in theory but it may not work for your dog. It's probably better that you don't encourage him to bark at all, and then you don't inadvertently create a problem. 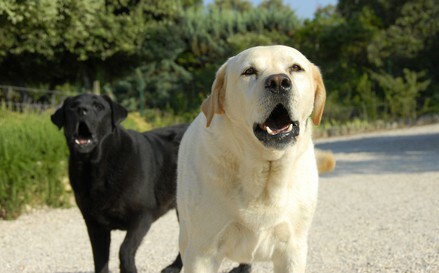 There are two types of collars used to stop dog barking behavior. The first is a citronella collar that emits a spray of citronella oil when your dog barks. These can work, but some dogs just put up with the smell and bark and bark until the citronella canister is empty, then they're free to do what they like. Electric anti-barking collars can have a more sinister effect. If your dog is looking at something when he is zapped, then he can associate the pain with what he was looking at. This can make him more aggressive towards that object. If you work for long hours, and your dog is left to his own devices, he may bark out of boredom or loneliness. To help to manage this, buy him some toys to keep his mind busy. Something as simple as a Kong stuffed with yummy treats will keep him licking and nibbling for hours. There are more complicated toys where he needs to push a button or slide a lever to get the treat. Some people choose to get a second dog to keep their dog company. This can work, but be prepared for twice the expense. You will also need to have a backup plan if it all goes wrong, and you end up with two barking dogs and twice the noise. Some people resort to debarking surgery to quieten their dog. This involves surgically removing the vocal cords, and really isn't a good option. It does make your dog quieter, but there is the risk of bleeding and other complications. It also stops him from barking to protect you. This really is a last resort because it doesn't tackle the reason for your dog's behavior. To be honest this one gives me the chills just writing about it, it feels cruel and selfish, unless it's necessary to save the dog's life. Although it takes a bit of time to establish, the best way to manage problem behavior when you are home is to teach your dog to come when called. Use food to reward your dog when he comes to you, and aim to have him reliably doing this when he is called. When he starts barking, investigate the reason for his noise. If all is okay, call him to you and reward him. Pat him gently to soothe him. When you let him go, you may find he starts barking again. That's fine, call him back to you and reward him again. You may need to do this four or five times. Your goal is to have your dog look over his shoulder at you whenever he barks, and rush to you for a reward when you call him to you to quieten him down. Believe it or not, there are some dogs that don't bark at all. The Basenji is a very silent breed and doesn't bark, but they do vocalize to some degree. There is no breed of dog that is guaranteed to be silent, but some are quieter than others. The Greyhound, the Pug and Cavalier King Charles Spaniel aren't known for their noise production. If you're concerned about having to stop dog barking in the future, choose a calm quiet breed to join your family.